By: Evelyn H., Lea M. and Sarah K.
When people draw, they usually start out with a set idea in mind of what they want their drawing to look like. But when the brain tries to put that idea on paper, it doesn’t always look perfect. Many people are frustrated by this but taking steps one at a time can lead you to success! We have some tips here that might help you if you run into this problem, so read on! First off, people often look to other sources of “Drawing Genius” to help them draw. “Drawing Geniuses” can be found on the internet, from a sibling or parent, or even just in a random place. People will look to incredible drawings to enhance their skills. But this is not the best course of action, as someone else’s drawings might not fit your style. If you try to copy drawings directly, in attempt to pass them off as your own, nine out of ten times it will fail (It is also called plagiarism and is often illegal). To really draw well, you need to focus on the tiny details. If you were drawing a leaf, you might go outside and find one beforehand. Notice the way the leaf’s edges curve, the way the sun hits it. If you bring a sketchbook out to practice, you may very well end up with a believable leaf. “Okay, sure.” you say. “That’s how you draw a leaf. But that’s so simple! I want to draw something more complex!” Well, to draw something like an animal or a landscape, you use the same strategy as you did with the leaf. The internet has great pictures that don’t move, so use those for animals or water. Let’s start with, say… a cat. 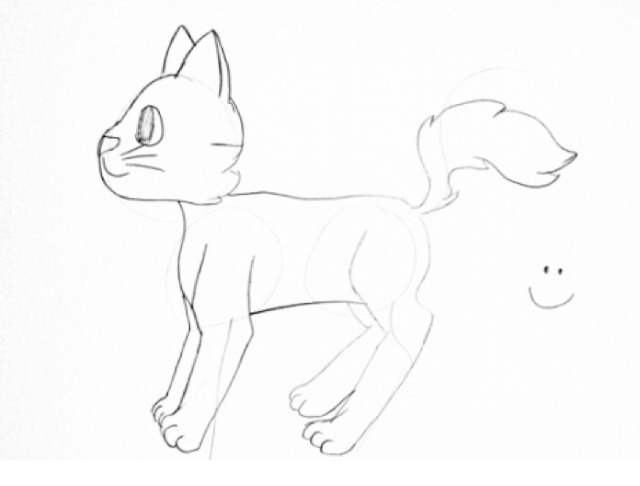 A cat is really pretty simple to draw, and you can advance your drawings over time. Start with a circle (We will erase it later, so don’t spend too much time on it). This will be the head. Draw a larger circle under it and a little to the right, to serve as the chest. Finally, about half an inch to the right of the second circle, draw yet another circle (about the same size) to serve as the haunches. If needed, draw some simple curves and lines to mark out the legs, tail and ears. Now, let’s break this down and get into the real cat drawing. Make sure you have some patience, because this will take 5-10 minutes, depending on your skills. Look at some online cat drawings to help. My example here will help you, too. Start with the head. Look at the ear closest to you and start drawing soft, slightly curving lines to complete it. Now, draw a curved line and a half-circle. This will be your forehead and muzzle. Make some fluff near the jaw, and connect the muzzle to it. Finish off the other ear, and make the nose, whiskers, eyes and mouth. Head complete! Now, let’s move onto the back, tail and back legs. Don’t be intimidated by this. We’ll make it simple. Draw a line, slightly curving in the middle and round it slowly around the back circle, stopping halfway. Do another smaller curve the opposite way, and then draw a line going diagonal-ish down. Draw the paw, and then do another line going diagonal-ish up (But not as far). Do a semi-circle around the back circle, and Ta-Da! A back leg. The tail is just a fluffy, curvy line. Not too bad, and you’re almost done! Finally, we’ll do the stomach, chest, and front legs. Draw a kind of fluffy semi-circle around the front of the second circle, and then do a sort of obtuse triangle. Do another semi-circle (Curve facing left) behind it, and then do the diagonal-ish lines and the paw. Finally, draw a line for the stomach! You’ve done it! Congrats! You’ve drawn a cat! If it didn’t turn out like you wanted it to, keep trying. Eventually, you’ll be drawing like a pro! As artists always say…practice, practice, practice!! !